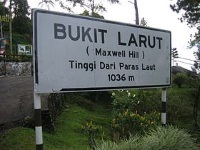 Formerly known as Maxwell Hill, the holiday retreat of Bukit Larut is Malaysia's oldest hill station. Situated in the wettest part of the country, the peaceful site's history stretches back to 1884, and the area is blessedly cool compared to the lowlands. Limited accommodation and a lack of development give the destination an old-world colonial charm, which the more popular hill stations no longer have. Eight charming bungalows nestle on the hillside, providing the area's only holiday lodging. The route to the top of the hill station is an exhilarating climb through virgin tropical jungle. Travellers will need a four-wheel drive to undertake the journey. Private vehicles are not permitted, though a government-owned Land Rover makes regular trips up between 7am and 6pm. Visitors can enjoy magnificent panoramic views of the Malaysian peninsula's west coast from the summit. The vista runs from Penang to Pangkor.